PAID ADVERTISEMENT. NO FEDERAL ENDORSEMENT IMPLIED. Note: This event has already passed. Date: Nov 10 2018, 9:30 a.m. - 11:30 a.m. The weather is starting to cool off and we're in the mood for fall! Join us for a fall themed craft outside! 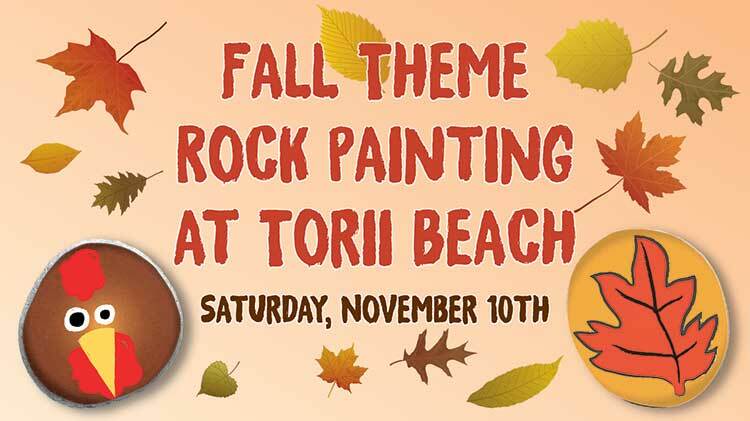 We’ve got a fall themed rock painting event (in partnership with Torii Arts and Crafts and Torii Outdoor Rec) for kids ages 2 and up on Saturday, November 10th from 09:30-11:30am at Torii Beach Pavilion #5. Sign up at Torii Arts and Crafts (Bldg 207). For more information, contact Torii Arts and Crafts at 644-4329. Cost is $10 per child and includes all supplies. Children MUST be accompanied by a parent or guardian at ALL TIMES. Sign up at Torii Arts and Crafts, in Building 207. Space is limited. Last day to sign up is 2 business days prior to the event. You are now exiting an Army MWR NAF-funded website and linking to a commercial advertiser's website. How can we do a better job helping you?